How many people engage in Sunday dinners? I’m not talking about heating something up and eating in front of the television, but actually sitting down with family or friends to enjoy a meal together on Sunday evenings. The idea of a “supper club” started in the 1930’s and 40’s as a time for people to get together and enjoy an entire evening together from cocktail hour to after-dinner entertainment. These events were semi-formal but with a fairly simple menu. 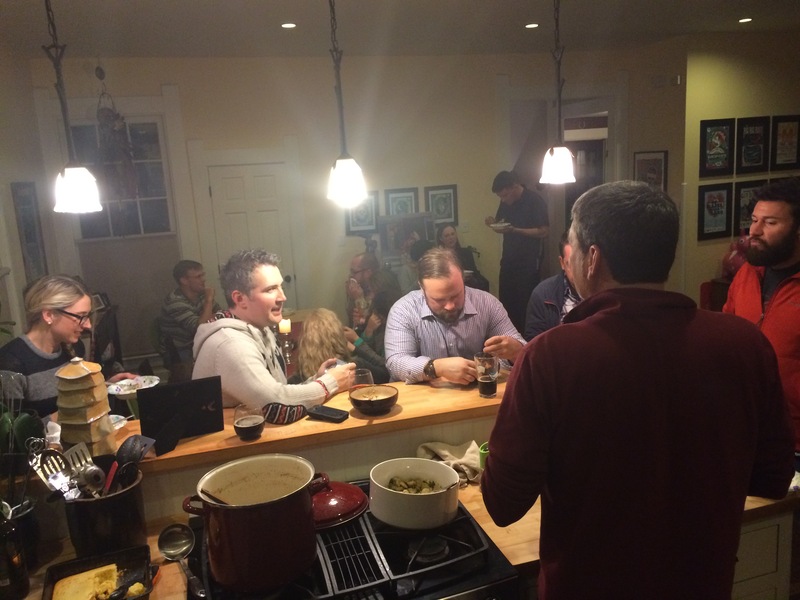 A supper club meant making time for your friends and family; dining, drinking, dancing and laughing. Fast forward to today and supper clubs are making a comeback in the age of on-the-run meals. Our hosts were master entertainers and excellent cooks, and we had a great group of people at our city supper. Ham and beans, kale salad, cornbread, corn casserole, Brussels sprouts and a savory sugar cream pie were on the menu for the evening accompanied by some Sun King brews. Whether you host a city supper to bring together neighbors, spend time with family or get together with friends, it’s a great way to reconnect and close out the weekend. As we get older, it can be harder to maintain friendships with busy schedules, kids, work and other commitments, so nourish these relationships with a good meal! One thing that has stayed the same from supper clubs nof the 30’s and 40’s to today is that an intimate meal with friends and family will never go out of style. Tags: all in, city gallery, citysuppersindy, harrison center for the arts, indiana humanities, Indianapolis. Bookmark the permalink.